APERAM came into existence when ArcelorMittal spun-off their stainless steel operations. Aperam is the 6th biggest stainless steel producer in the world, the 2nd largest in Europe and the largest stainless and specialty steel producer in South America. The company had annual production capacity of 2.5 million tonnes in 2009 in stainless and specialty steel. The Company is also a leading producer of high value-added specialty steels products, including grain oriented (“GO”) and non-grain oriented (“NGO”) electrical steels and nickel alloys. Its production capacity is concentrated in six production facilities located in Brazil, Belgium and France. Its distribution network is comprised of 19 steel service centers (“SSCs”), 10 transformation facilities and 30 sales offices. The Company sells its products to customers on three continents in over 30 countries, including customers in the aerospace, automotive, catering, construction, household appliances and electrical engineering, industrial processes, medical and oil & gas industries. According to Chairman Mittal in the spin-off prospectus: “Stainless steel is a capital intensive business that has been competing within ArcelorMittal for capital allocation against the core strategic areas of focus for the ArcelorMittal group, which are mining division expansion and carbon steel growth projects in the emerging markets. Furthermore, the stainless division does not receive the attention it merits from the financial markets as it is part of the wider ArcelorMittal group and represents only 5% of group EBITDA. Pure-play stainless steel companies have generally traded at a premium in the market compared to carbon steel and diversified steel companies. The Mittal family is not dumping the operations as they will keep a 40% ownership after the spin-off and Mr. Mittal will serve on the board of directors. Also, the balance sheet look relatively clean as no debt was dumped on the spinco as often happens. Structural overcapacity: Steel production has deep political implications as local communities often depend on employment from these operations. Therefore unprofitable operations are kept alive for political reasons, subsequently hurting the overall industry profitability and efficiency. Additionally, as it is a capital intensive industry, winding up unprofitable operations can be very costly. Pricing forces: European stainless mills calculate prices for their products by adding a monthly alloy surcharge to recoup the cost of the raw materials they buy. The nickel price is the largest component of that surcharge. Therefore, nickel prices play a key part in determining the prices for stainless steel. When nickel prices go down, stainless distributors become hesitant in their purchasing (link). The reasoning is that if they buy at current prices but nickel continues to drop, they will have a cost-disadvantage to distributors who delay buying. About 60% of nickel consumption comes from the making of nickel steels, so I suspect some sort of reflexivity effect. – According to statements from the Aperam leadership European stainless steel producers used about 70% of their capacity in 2010 but it forecasts a growth in demand of about 6% a year in the medium term, with emerging markets averaging 7% to 8% and Europe about 3% to 4%. The potential for demand growth is greater in stainless than carbon steel national demand for stainless (as opposed to carbon steel) increases as countries become more developed. Stainless steel represents only 2% of total world steel market in volume but consumption is likely to return to levels seen before the global economic slump by 2013 or 2014. – A lower alloy surcharge marks down the value of producers’ inventories, so analysts expect steelmakers to post inventory-related losses in the second quarter. – ThyssenKrupp, Germany’s biggest steelmaker, is also made public its intentions to spin-off its stainless steel arm (link). Book value per share is roughly $51.2 with inventories representing about $13 per share. The shares are trading at around €17 in Amsterdam (APAM.AS) and $24 OTC (APEMY.PK) currently. Interest bearing liabilities are about $1.1 billion ($14.5 per share) or 28.3% of book value of equity. They had $268 million of cash in the 3Q of 2011 ($3.4 per share) and no goodwill is recorded on the balance sheet. Their earnings and free cash flow have been weak in the last 3 years after breaking all records in 2007 ($14 per share in FCF). Assuming Aperam is worth their book value to a private buyer, the potential upside would be about 50%. Assuming duration of 18 months, the annualized potential return comes in at 33%. 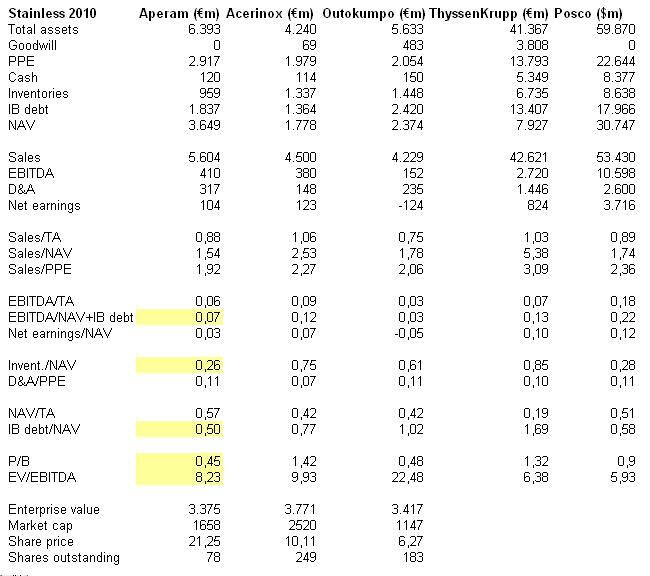 – The book value of Aperam seems to be in-line with its peers as (1) amortization and depreciation rates are similar to peers, (2) sales-to-total assets and sales-to-PPE are similar to its main competitors Acerinox and Outokumpo and ebitda-return on invested captial (equity plus interest bearing debt) is similar to industry average. – The market price of Aperam seems to be undervalued as EV/EBITDA is much lower than that of its closest peers as well as its P/B-ratio.